August 15, 2018, 6-8 pm. This is a free event. No Sign up required, simply show up if you’re interested! CAD (computer-aided design ) is the use of computer systems to design, develop and optimize products, enabling designers to layout and develop work on screen, print it out and save it for future editing, saving time on their drawings. 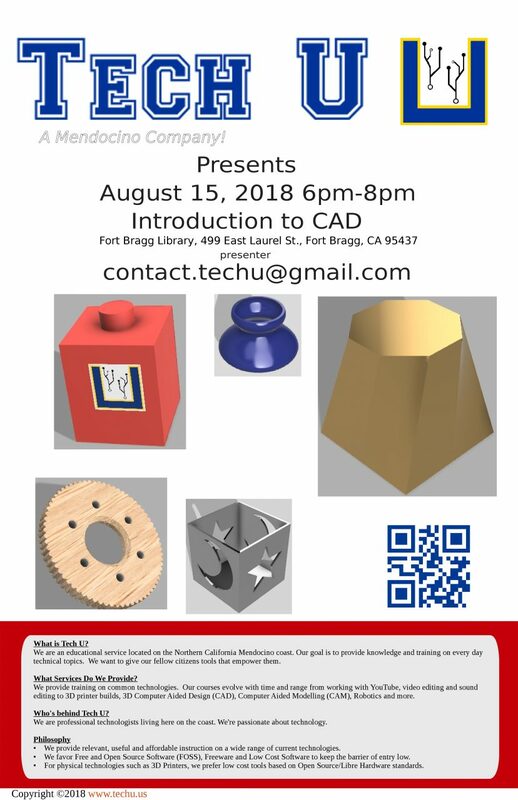 CAD is an important industrial art extensively used in many applications, including automotive, shipbuilding, and aerospace industries, industrial and architectural design, prosthetics, and many more. CAD is also widely used to produce computer animation for special effects in movies, advertising and technical manuals, often called DCC digital content creation. The modern ubiquity and power of computers means that even perfume bottles and shampoo dispensers are designed using techniques unheard of by engineers of the 1960s.